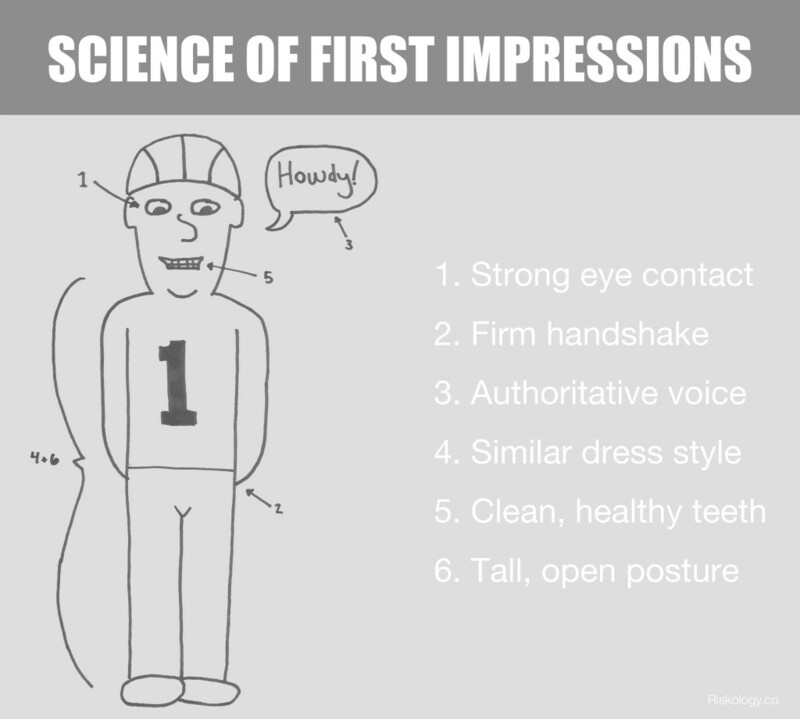 The gist: Decades of research have found 6 primary qualities that go into a successful first impression. To make better first impressions, implement these 6 rules. You probably don’t realize as you’re doing it—I don’t—but every day you quietly judge the people you meet. You look for clues that will tell you what type of person they are, if they’re confident in themselves, and whether you can trust them. And everyone you meet is doing the same to you. Have you ever met someone a few times and thought, “I really should like this person… but I don’t.” That’s the first impression at work. Something about the way they presented themselves to you in the first few moments of meeting triggered a negative response from your subconscious brain and, try as you might, you can’t shake it. As you’ve probably heard at some point in a fight with a loved one, it’s not what you say, it’s how you say it. The majority of the communication you have with the people around you is non-verbal—your body language. And you’d hardly be alone if you don’t have a clue what it’s saying most of the time. Today, that changes. And your relationships change with it. When you meet someone, you create a rule in your brain for them. If Joe just met you on a bad day and is actually a good guy, he’ll have to spend a lifetime building up a series of exceptions to your rule. I can see this at work in my life. I have friends of friends that I’m happy to be around in certain situations, but plenty of others where I’d rather not see them. Logically, if my friends (who I think are great) think someone else is great, I should probably agree with them. But that’s not how the brain works. If you can hang onto an undeserved bad impression, though, you can also hang onto a good one, believing someone is great even though they’ve demonstrated over and over they aren’t simply because you saw their bright side at the beginning. That’s how people end up staying in terrible relationships and why you have that “one friend” you always have to apologize for. Whatever the case, you see how important it is to make a good first impression. Whatever impression you make on someone, you’ll spend a lifetime building exceptions to their rule, but never changing it. So why not make a great one from the start? Life will be a lot easier. The million dollar question, of course, is “How do you do that?” Glad you asked. Hundreds of studies have been done on human relationships and forming impressions. The intricacies of the science are many, but there are a few things almost all the research has agreed works, like some sort of magic spell, to cement a good impression of you in the eyes of the people you meet. You’ll notice many of them are correlated with displaying high self-confidence. 1. Strong (but not too strong) eye contact. One of the most intimate things everyone will notice about you is your eyes. More specifically, your eye contact. The way you look at someone when you meet will instantly convey significant information about you. And, according to the research, strong eye contact = good. This is because eye contact is viewed as a sign of self-confidence, and that triggers the brain’s trust response. But eye contact can also be tricky. You want to look people in the eye, but you don’t want to stare at them. Staring is universally seen as aggressive. The best thing to do is to look someone in the eye when you greet them and then return regularly to short but noticeable lengths of eye contact. Don’t try to hold eye contact through a full conversation. That would be weird. Firm. A good handshake should be firm, but not hand-crushing. Warm. A warm hand signals a warm personality and a cold one signals a cold personality. That’s ridiculous, but it’s how our brains operate—by association. Dry. A dry hand means you’re not sweaty or clammy. Not being sweaty means you’re calm. And being calm indicates confidence. Before you shake someone’s hand, warm it up, dry it off on your clothes, and remember to squeeze. 3. A voice of authority. Here’s an interesting thing about humans: our voices change predictably as we enter high or low-power scenarios.5 So, what makes for a confident tone of voice? The research says it’s a bit lower, less singsongy, and more dynamic (a greater range of loud and quiet). This is where a lot of typical advice gets it wrong. Read almost any style or career article, and the advice is to “dress to impress”—put on the best clothes you’ve got to make a good impression. The reality is not so true. Dressing well can give you the perception of authority (which is useful in many situations), but it won’t necessarily help you make a great first impression. When it comes to making a warm and welcoming first impression, people want to know that you’re like them, not better than them. One of the quickest ways to tell is to look at the clothes you wear. 5. Good hygiene (in some situations). This is another place where the generic advice columns often get it slightly wrong. They say to always keep yourself as clean as possible. It’s not bad advice—you’ll do better keeping yourself neat than you will otherwise, but the truth is the importance of hygiene for a good impression is actually situation dependent. The best advice is to keep yourself clean—particularly your mouth and your home (if you’re having guests over)—but you may be forgiven if you hit the other points well. The way you stand will play a part in how you’re perceived. Standing in an open, relaxed posture—chin up, arms at your side, back straight—signal that you’re a warm and friendly person. When you hunch over or make yourself small, you invite the subconscious of the person you’re meeting to wonder if you lack confidence or have something to hide. If you have the habit of folding your arms or hunching, a quick way to check yourself is to focus on taking deep breaths into your stomach. Your stomach will comfortable expand when you’re standing tall and open. If you notice any discomfort or that your stomach is hitting your arms as you breath, that’s your queue to straighten yourself out. You really don’t have to remember that much and, if you keep it front of mind for even a week, you’ll start to internalize many of these actions. Shake with a firm, warm, and dry hand. Make your voice more authoritative. Dress similarly to the person you’re meeting. Stand tall with an open posture. Now go get ’em, Tiger. The world is your oyster. Source: Interviewer perceptions of applicant qualifications: A multivariate field study of demographic characteristics and nonverbal cues.